The Sausalito Foods brand has exemplified quality for over a decade. Our network of trusted suppliers and strict control over processing are the keys to consistently delivering only the world’s finest olives, onions, mixes, fruits and vegetables to our valued customers. Sausalito Foods was founded in 2004 by Wally Van Cleave, a veteran of the food industry with over 50 years of experience. Seeing that the stuffed gourmet olive industry was underrepresented in the market, he began importing olives from Argentina, Greece, Spain and Turkey, then hand-stuffing them at a state-of-the-art facility, centrally located on the Gulf Coast of Texas. After quick success, the product line was expanded to include dirty martini mixes and cocktail onions. Today, though we sell an array of over 20 products including Bloody Mary and Bloody Caesar mixes, pickled vegetables and decadent Amarena and maraschino cherries, our focus has remained on one thing: Quality. 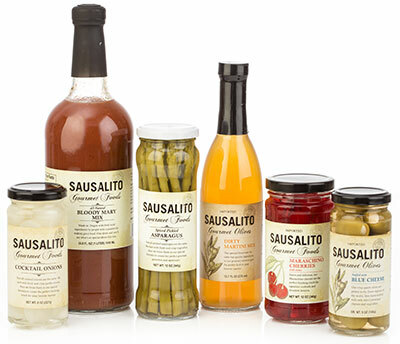 You can find Sausalito Foods products online at sausalitofoods.com, in liquor stores and grocery chains, or at your favorite upscale restaurant or bar. One bite and you’ll see why our top-shelf garnishes and appetizers are truly the best you can buy. *Imported Pimento olives generally come already stuffed from the point of origin. Obviously, pitted olives and cocktail onions are not stuffed. Please note, our Drunken Onions ARE hand stuffed with pimiento and jalapeno peppers.